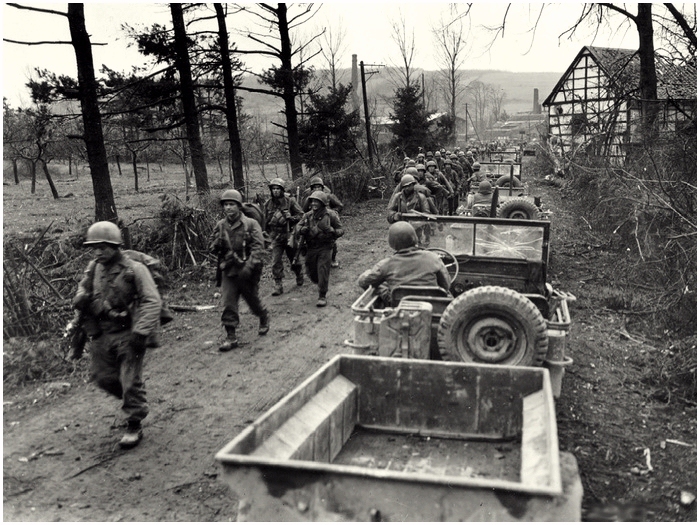 Above, GI’s of the 18th Infantry Regiment, 1st Infantry Division, move on February 29, 1945, through Frauwüllesheim in Germany. A month later, two Medal of Honors were handed to men of this outfit. 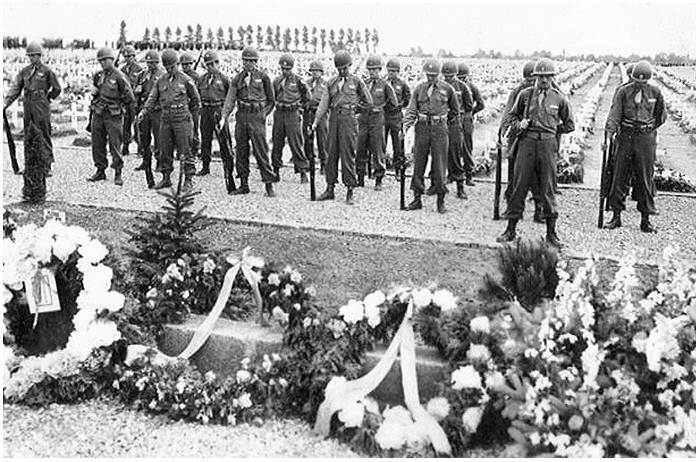 Both men, George Peterson and Walter Will, were killed during the actions, and are buried at Margraten. They received their awards posthumous. 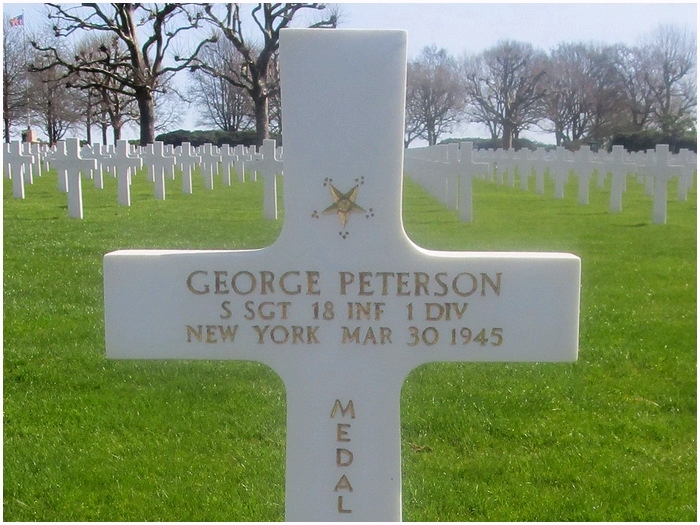 Staff Sergeant George Peterson came from Brooklyn, New York and served in Company K, of the 18th Infantry Regiment of the 1st Infantry Division. His company came under enemy fire near Eiseren, Germany, on March 30, 1945. A German Battalion tried to keep the American company at distance using mortars, machineguns and rifles. The Second Platoon was ordered to attack the flank of the German position, the remaining men of the company would undertake a frontal attack on the position. Sergeant Peterson crawled to a position from where he would attack. He signaled the 2nd Platoon to follow him. A mortar fell jus beside him and Peterson was wounded on both his legs. Bleeding from his wounds, he struggled forward to the enemy positions. Two German machineguns opened up on him. He reached a small dent in the ground that gave some protection. He reached for a grenade and rose to his feet. In a hale of bullets he tossed the grenade into the first machinegunpost. The crew of the machinegun were killed or wounded, and the machinegun was silenced. But the remaining machinegun kept on firing at Peterson. With another grenade he stopped the firing from that machinegun as well when four Germans got killed. While he was crawling forward, a bullet hit him in the arm. But Peterson crawled a 20 yards more before he shot a grenade from his rifle into an enemy stronghold. Three Germans were killed, and the remaining were on the run. With the enemy positions in American hands, the medics finally were able to treat his wounds. While he was banded up, a mortar fell near one of his men that wounded him. Peterson jumped away from his medic to help the fallen soldier. During this rescue, Peterson was hit by a bullet that killed him. 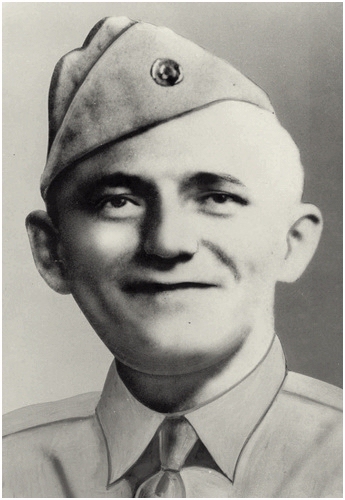 October 17, 1945, the Medal of Honor was approved to George Peterson for his persevere action and to put the wellbeing of his men above himself. Because of this, three German positions could be taken with minimal loss. 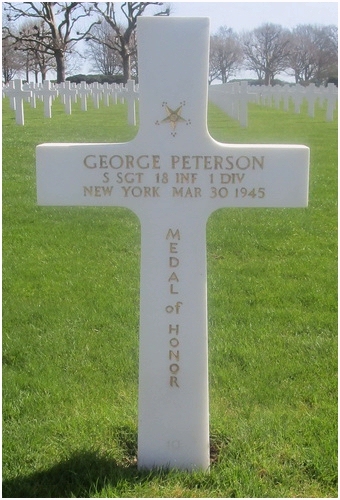 Staff Sergeant George Peterson is buried at Margraten in plot D, Row 21, Grave 10. 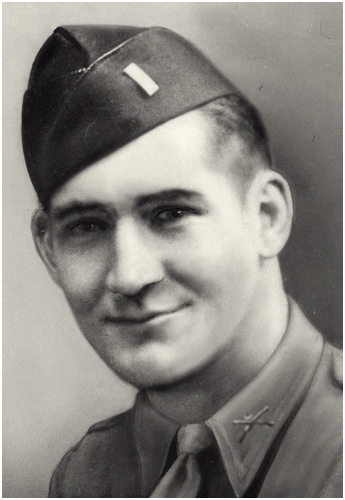 Just as the above mentioned Peterson, First Lieutenant Walter J. 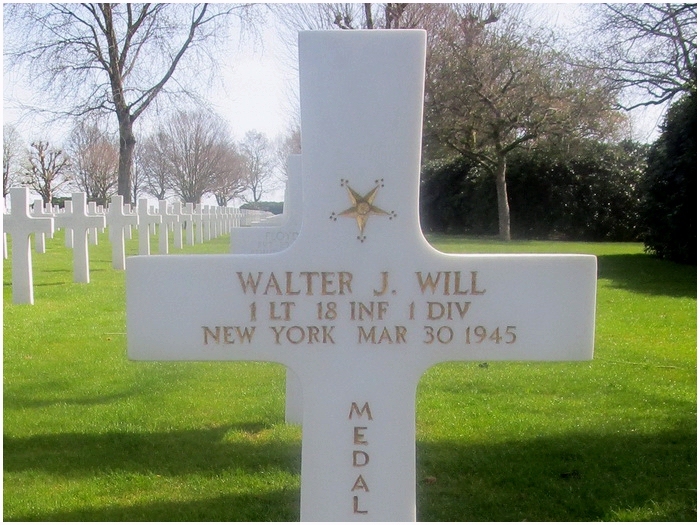 Will served in Company K of the 18th Infantry Regiment of the 1st Infantry Division. And just as Peterson, Will was on March 30, 1945 in the surroundings of Eisern, Germany. Walter Will, from West Winfield, New York guided his men during an attack on the heavily defended German stronghold. When he was helping two wounded men, he was hit also. In spite of his wounds, he went back into the field to collect another wounded man. After that, he led his platoon, bleeding from different wounds, in the attack on German positions. When they came under a crossfire from enemy machinegunfire, they were pinned downed. Lieutenant Will crawled within10 yards of the enemy position and fired a grenade. Four Germans were killed, and the machinegun was silenced. Will soon was crawling towards another German position. When he was just a couple of yards away, he jumped up en ran towards the machinegun. The nine Germans at this positions were surprised and surrendered. A short time later, Will noticed that another platoon was under fire from two German machineguns. With a small group Will made a outflanking maneuver and silenced the first machinegun with three well placed hand grenades. With great aggressiveness he stormed forward and shot with success a rifle grenade into the second machinegunpost. When he returned with his platoon, he guided his unit in a inspired attack on the last defense of the German position. When the Germans retreated, it became clear that Will was critically wounded and was killed in this final action. 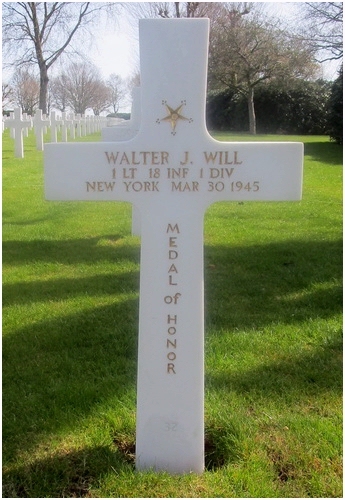 The Medal of Honor was posthumously granted on October 17, 1946 to Walter J. Will. 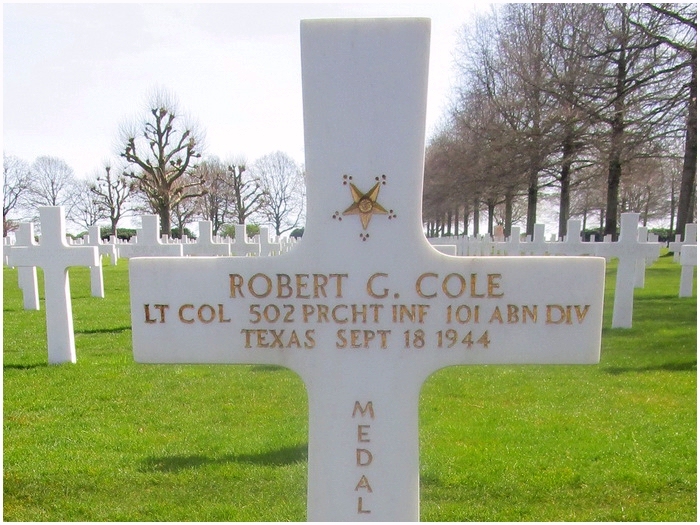 Robert G. Cole, born March 19, 1915, in Fort Sam Houston, Texas, went unto American service in San Antonio, Texas. IN March, 1941, he received his 'para-wings' when he is a lieutenant. In 1943 he commands the 3rd Battalion of the 502nd Parachute Regiment, of the 101st Airborne Division. After the landing during D-Day in Normandy Lieutenant Colonel Cole got noticed when he and some men killed at least 75 Germans near 'Exit 3' at Utah Beach. Four days later, Cole was ordered to capture five bridges that lead into Carentan from La Croix Pan. Despite their efforts, the 3rd Battalion was pinned down in the murderess fire the German lay on them. After five hours of German mortar fire, and many casualties, Cole decided to make a last heroic effort to make a break in the stall and take their object. After a heavy bombardment by the American artillery on the German positions, he ordered his men to place fresh magazines in their rifles, and to fix bayonets. 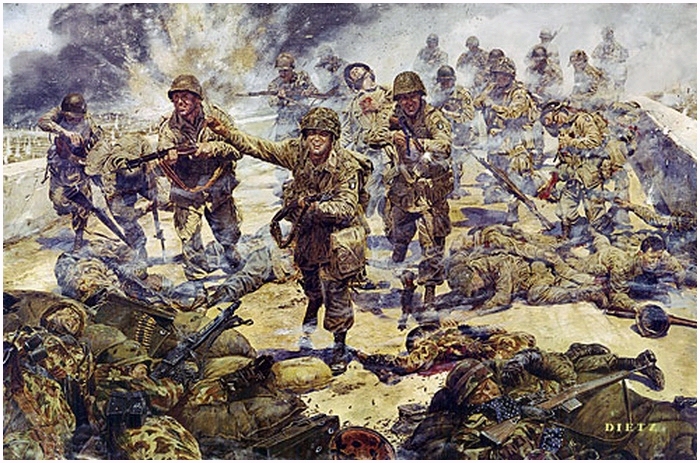 Painter James Dietz depicted the attack of June 11, 1944. In the early hours, at 06.15, a whistle blew to signal the attack. Cole himself guided his men, pistol in hand, forward to the German positions. When one of his men is hit, Cole takes up the man's rifle. With the bayonet pointed forward, he storms ahead. In a fierce battle, in man to man fighting at close range, the bridgehead is secured. This bayonet attack is the first American of the Second Worldwar. The unit had a lot of casualties, and from that day on, the road where the battle took place was called 'Purple Heart Lane'. Lt. 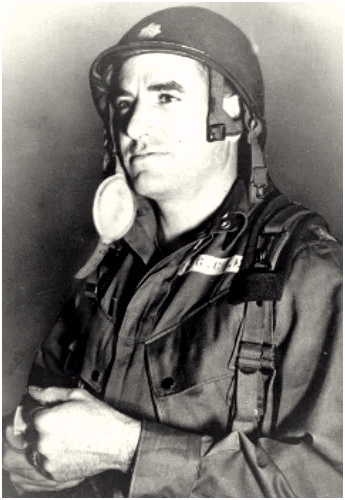 Colonel Robert G. Cole was given the Medal of Honor for his valor and determent leadership. Unfortunately, he never could wear it. Before he received the Medal, he was killed during Operation 'Market-Garden', September 18, 1944. He was shot by a German sniper when his unit was attacking a bridge near Best, Holland. October 30, 1944, his mother was given the medal, in presence of his wife and two year old son. 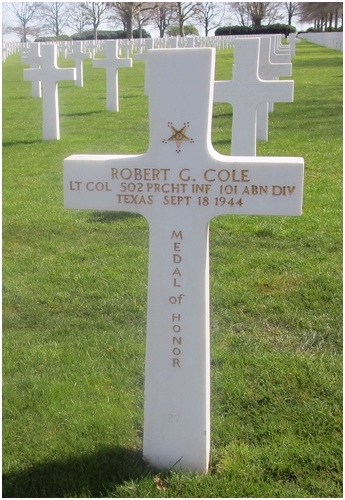 To honor Robert Cole, the Cole Junior and Senior High School at Fort Sam Houston is named after him.